Product #22137 | SKU TS4GUSDHC10 | 0.0 (no ratings yet) Thanks for your rating! 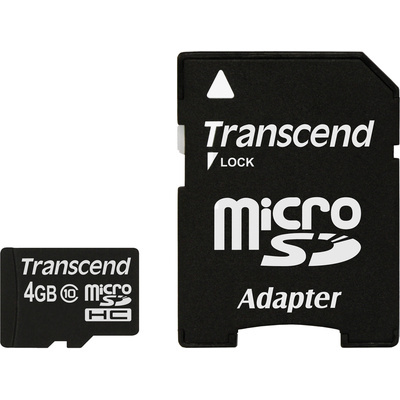 The Transcend 4GB Premium microSDHC Memory Card with SD Adapter is a great card for a variety of devices in your digital life, along with an adapter that allows compatibility with even more devices, including your computer. With 4GB of storage, SD 3.0 compatibility, and class 10 compliance, this microSDHC card is future-friendly, able to store or transfer a decent amount of information. Other highlights of the card include the mechanical write-protection switch, a built-in Error Correcting Code (ECC), and In System Programming (ISP) for updating firmware. These helpful features, along with Transcend's limited lifetime warranty, provide you with peace of mind and a memory card that's worthy of protecting your data.